The bigger the screen, the better on this movie. But it should be a joy regardless. When brainy, bobble-headed computer-toon hero Jimmy Neutron tells his mom he's contacted alien life forms in "Jimmy Neutron: Boy Genius," she's taken aback by his disobedience. "Jimmy," she scolds, "how many times have I told you not to talk to strangers?" It's a moment that defines the wit and whimsy of this spirited CGI kiddie creation, which is absolutely popping with personality and prodigious production design. It's up to the kids to rescue their folks, of course, and the energetically eccentric, socially shunned Jimmy becomes their defacto leader when he helps the other children fashion an armada of silly spaceships out of rides at a newly opened amusement park. But it's the intrepid, undaunted enthusiasm of Jimmy himself that gives the picture its pizzazz. 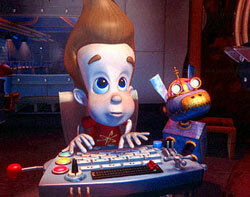 Laughed at for his crazy inventions that never quite make him look as cool as he hopes (a misfiring shrink-ray, a bubble-gum bubble he climbs inside to bounce to school), Jimmy's effervescent perseverance is a good lesson in overcoming frustration for the movie's adolescent target audience. Thankfully, however, director John A. Davis and his writing partner Steve Odekerk are more interested in amusing the viewer than in harping on such themes, so the movie is accessible to us grown-up kids too. Offering less creativity in its over-simplified story and its shopworn secondary characters, "Jimmy Neutron" stops short of being an instant classic like this year's other computer animated kiddie flicks, "Shrek" and "Monsters, Inc."
But even if it isn't timeless, it is just as much fun and I'm totally gung-ho to see it again.